Because I am heading home tonight and M has to work the holiday, we had Thanksgiving dinner last night. Since he's a vegetarian, he prefers sides, but I did buy him a meat-free "turkey" to round out the meal. The brand is Gardein, which I bought at Honest Weight. I have to say... it was pretty good. Could have done without the cranberry stuffing, but I will probably buy this again for him for Christmas. 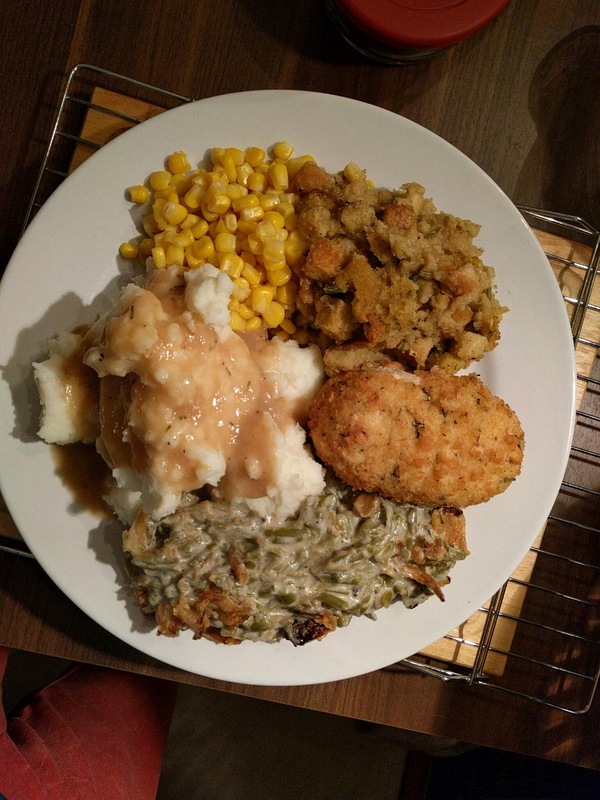 Green bean casserole - tried and true. First time I added soy sauce... or maybe I always have and just keep forgetting. Either way, lovely. Cornbread stuffing casserole - M wanted Stove Top, but then had mentioned a co-worker had tried the Trader Joe's version and liked it. So I went with that, using vegetable stock for the liquid and added a tablespoon more butter than the recipe called for. Pretty good, I had to stop myself from eating all of it. M does need leftovers for tomorrow. Gardein savory stuffed turk'y - So much better than tofurky. So. Much. Better. It does have a weird taste that I couldn't place, but it wouldn't stop me from having it again. It also comes with gravy packs which helped me out since I couldn't find a veggie friendly pre-made gravy. Corn - nothing fancy, just heated up. Mashed potatoes - instant, I cheated. Fancied it up with cream and extra butter. And the gravy from the turk'y helped. Bloody Mary's - why not? Plus I needed to kill the last of the vodka that's been sitting there. Extra horseradish. Because. Yes. Total price for this dinner, excluding drinks, was ~$24.00. All but the stuffing and turk'y was bought at Dollar Tree. So now you know, a holiday dinner is possible from there. Slightly more expensive than if I had bought it from Walmart or perhaps the supermarket, but if it's the closest place... do what you gotta do.